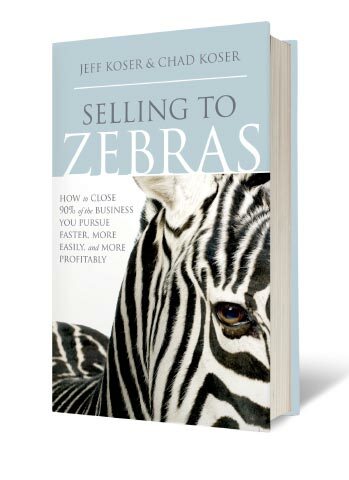 With their book Selling to Zebras: How to Close 90% of the Business You Pursue Faster, More Easily, and More Profitably Jeff and Chad Koser have found themselves a very interesting niche in sales consulting and training. Most of the sales technique books that I have seen in my lifetime on how to sell often have focused on relationship sales, closing or other “me” type sales. In all honesty, much of this might get you into the door but it won’t get you a contract when it comes to complex sales that involve corporate or bureaucratic structures. Selling to Zebras on the other hand wipes the slate cleans and starts from square one. how to (pardon the pun) “spot” the zebra. They take the reader by the hand and show the way to become a zebra spotting expert. First, know thyself! Once you know exactly who your company is and what you can offer then you can know who your target zebras are. Then you put them in your pipeline and drop any prospects who are obviously not zebras – companies that are ill fitting to your products and services for a variety of reasons. In my own business I find that this is actually very important to the success of sales. It really narrows the amount of cold calling and chasing up dead ends, which kills everyone’s quotas. Once you have identified your zebra there is a process of finding “Power” (the main decision maker), finding Power’s pressure points, doing studies of the prospects firms and partnering with them so that the sale is not only assured but will have better chances for the long-term surviving and flourishing of the client-customer relationship. Jeff and Chad Koser have made their book very interactive with their working website and have supplied the readers with easy to use and easy to understand tools that they can download. It was a great extra effort by the authors to give us these tools – they were worth the price of the book alone! Selling to Zebras. The only ones who might disagree would be your competition! Besides being a business-to-business networking expert, Gary Dale Cearley is an author, researcher and book reviewer in his own right. You can find out more about Gary Dale at his personal website or you can also follow him on Twitter.